Last week was a ripper! Most of my school visits end with a Q&A but on Friday a trip to St Martin of Tours Primary School in Rosanna, Victoria, ended with a photo instead. 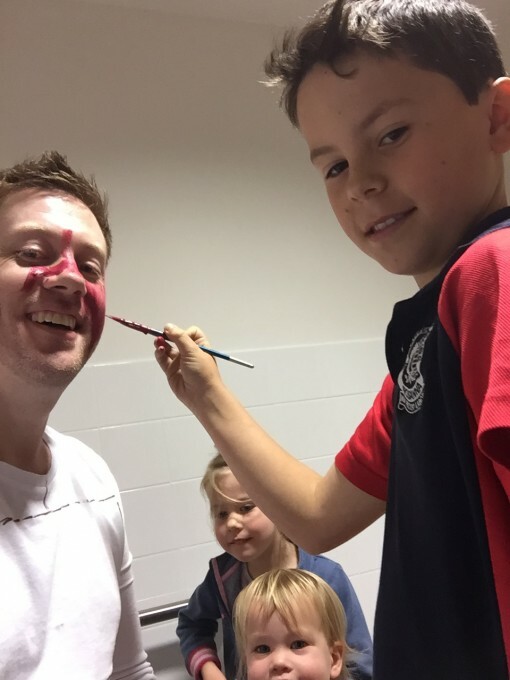 A most unusual photo… (Yes, that’s me as a purple emoji!) 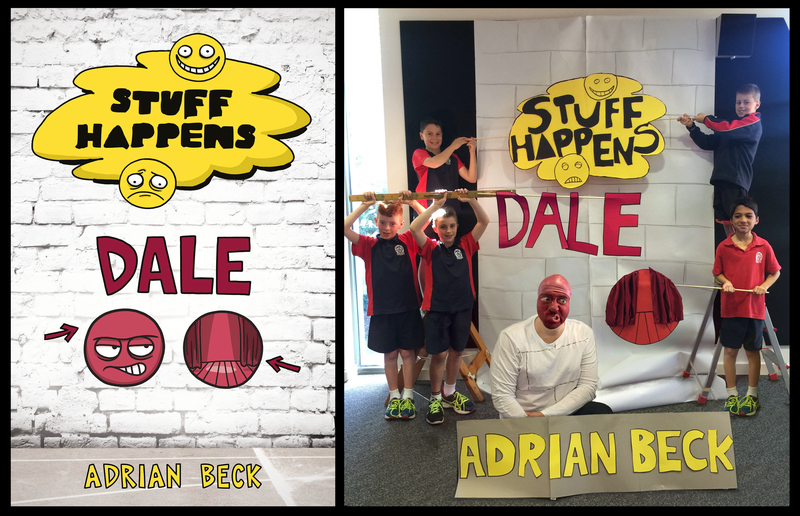 The photo we took recreated the front cover of my latest book, Stuff Happens – Dale. 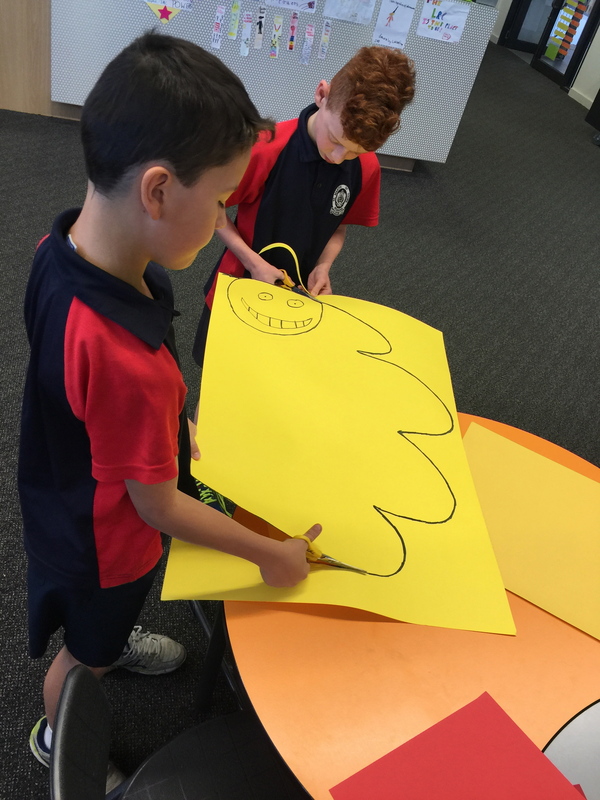 The Stuff Happens logo is a tricky yellow cloud-like design but nothing fazed these kids. They got to work straight away. Then once the logo was sorted, they started cutting out black letters to spell ‘Stuff Happens’ on top. Plus there was my all-important name to take care of. Get those letters in the right order kids, I don’t want to be known as A DRAIN! Of course my head needed to be transformed with face paint to look like the purple emoji cartoon character from the cover. (My daughters certainly wondered what their dad was up to.) 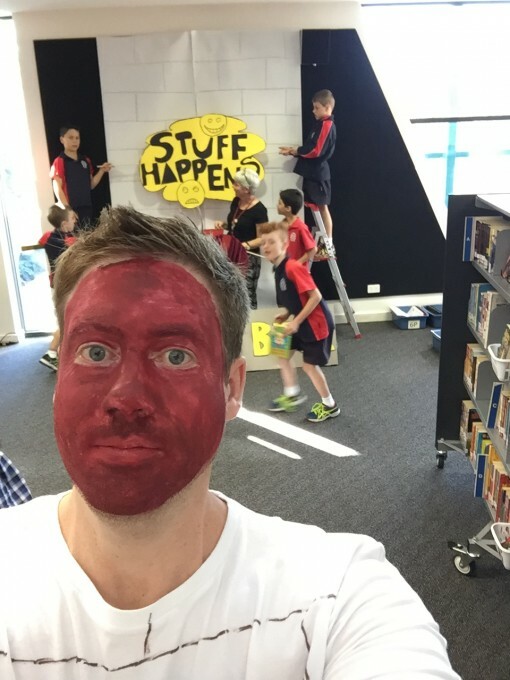 And once that was done it was time to take a quick selfie as all the elements were put in place. Everyone took their position, I put on a purple swimming cap and SNAP! We have a life-sized book cover! Great work, kids! 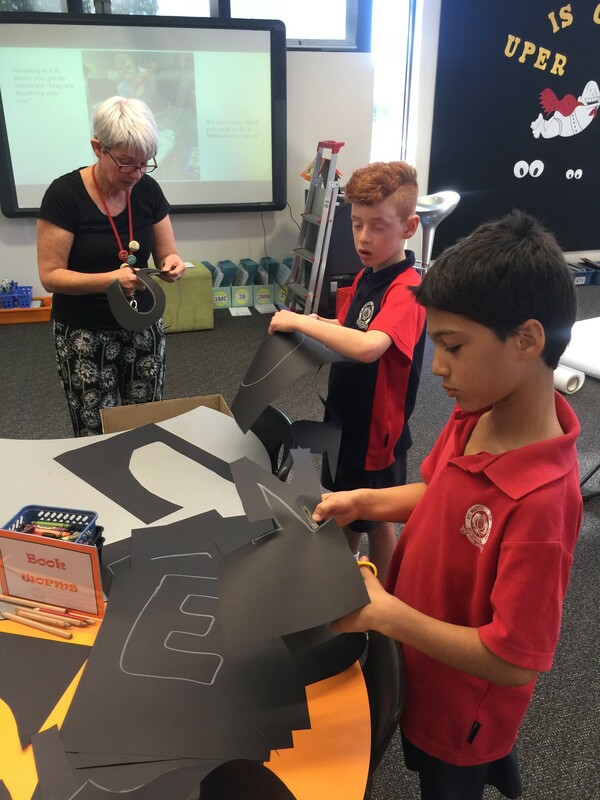 A huge shout out to Kim Yeomans, the St Martin’s Teacher/Librarian extraordinaire is always devising ways to bring books to life and to make reading fun for her kids. Check out her terrific blog here. She is a total superstar and living proof of how important this endangered role is in our schools. 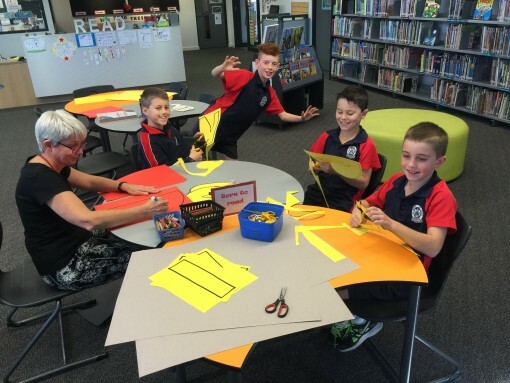 Thanks HEAPS to Kim and the hard-working kids. Best art project ever! I’m thrilled to hear that. It’s all about finding the right book, as they say! The kids did such a terrific job creating the cover. It was a lot of fun and I think we all made a great team! 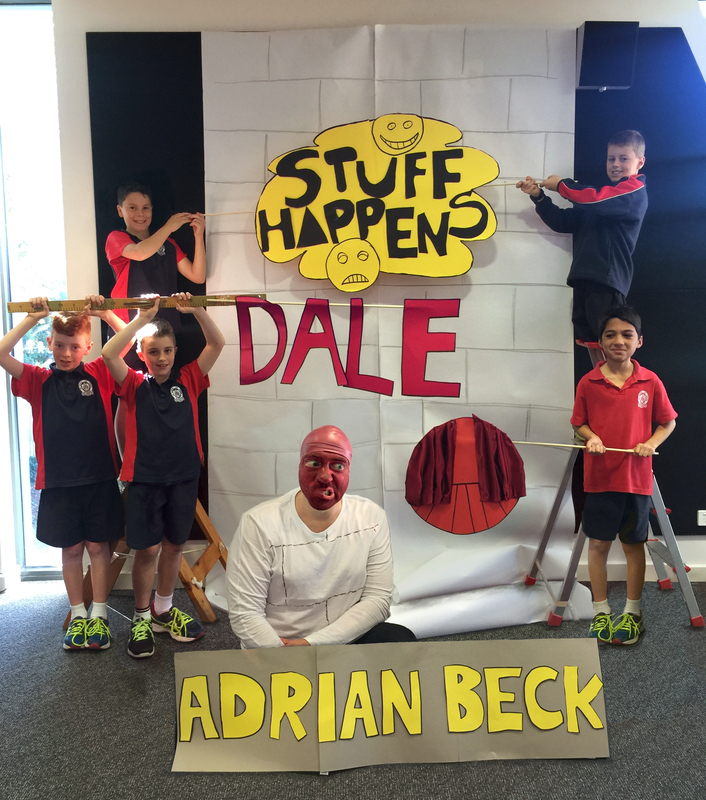 Grade 4TV think you all did an amazing job of making the front cover. 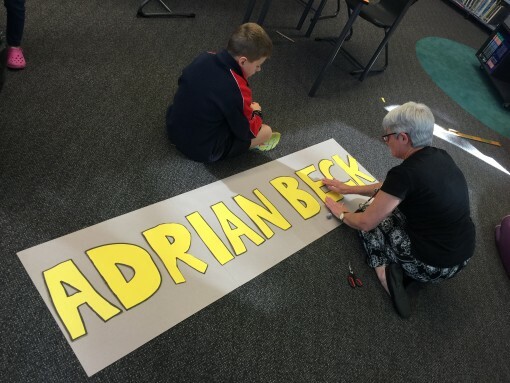 We certainly are very lucky to have Miss Y at our school. Thanks for all your help. You guys were awesome! Say hello to all the kids at 4TV for me. And make sure you give Miss Y a big high five for being all-round amazing.